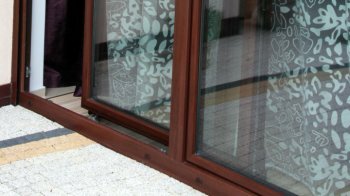 The most popular sliding doors now are the so called “PSK doors” (Parallel-Schiebe-Kipp-Tür – parallel tilt and sidle door). Structures of this type are made of standard window profiles. Leaf sliding is possible thanks to a special fitting system. After turning the handle from the closed position, the leaf slides to the inside of a room, perpendicularly to the window and then moves to the side. It is also possible to tilt the door leaf. Two-section – the leaf slides on the left or right fixed section. There is also another type of the PSK door – leaves slide on the inner side of the building wall. Such a solution makes it possible to fully open the door. In such a case, the guide rails of the fitting mechanism must be fastened to the window frame and the inner side of the building wall. The frame must be mounted in one plain with the inner surface of the building wall. Maximum leaf dimensions for the PSK door are about 1600×2100 mm or 1400×2300 mm. The main advantages of the solution are moderate price and high tightness. There are also some disadvantages including high threshold (window frame) and possible problems with opening and closing the leaves, if operated improperly.